James Luther "J.L." Turner (February 28, 1891 - April 19, 1964) was the founder of J.L. Turner and Son, the predecessor of Dollar General. James Turner was born on February 28, 1891 to Johnnie and Nancy Turner. His father died in an accident in 1902, resulting in Turner leaving school and finding a job. James never returned to school, and did not learn how to read. Turner married in 1908 to Josephine Marcum. He decided to get into retail by opening a bridal shop with Josephine. The bridal shop lasted one year and they moved to Kentucky where he opened a country store. After four years the country store closed. After his country store closed down, Turner worked as a salesman for a wholesale grocery company and then a dry goods retailer in Nashville. During the Great Depression, Turner was a traveling salesman and liquidated merchandise of bankrupt general stores. The liquidated merchandise from these stores became part of Turners' own general store J.L. Turner and Son established in 1939 with his son, Cal Turner. After World War II, dry goods wholesaling declined leading James to shift his business to retail. The shift to retail led to J.L. Turner and Son reaching annual sales of over $2 million by the 1950s. J.L. Turner and Son grew to 35 department stores in Kentucky and Tennessee. On June 1, 1955 James and Cal opened the first Dollar General store in Springfield, Kentucky. In 1964 James died at the age of 73. J.L. Turner and Son turned into Dollar General Corporation in 1968 under his son Cal Turner. 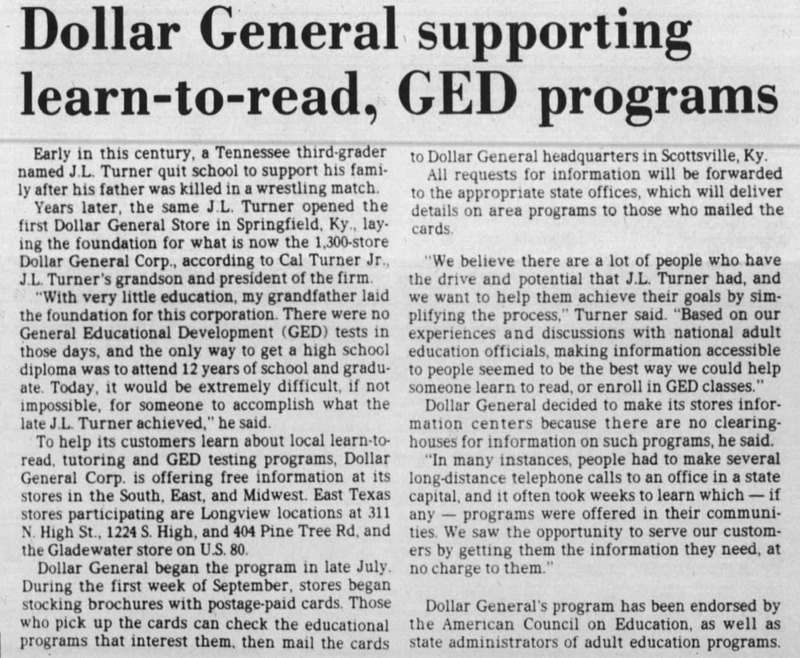 His grandson, Cal Turner Jr., established the Dollar General Literacy Foundation in his honor. ^ Scavotto, Andrew. "Dollar General founder cal turner sr loved small town life". Nashville Post. ^ a b "DG Recognizes National Tell A Story Day". Retrieved 19 January 2018. ^ Martin, Douglas (November 20, 2000). "Cal Turner, 85; Founded Dollar General". New York Times. Retrieved 18 December 2017. ^ "DG History". Dollar General. Retrieved Jan 19, 2018. ^ "Dollar General supporting Learn-to-read". Longview News-Journal (Longview, Texas). Sep 6, 1987. Retrieved Jan 20, 2018. This page was last edited on 26 December 2018, at 18:52 (UTC).